Many of us have legendary stories about misspent weekends in Montreal. But just an hour east of Quebec’s fun town Metropolis (or a four-hour drive from Boston, six hours from New York, and just one and a half hours from Burlington), are Quebec’s Eastern Townships, where you can luxuriate in thermal spas, meet the cows that helped make your cheese, and hike around gorgeous historic towns, all for 75-cents on the Canadian dollar. Here are some ideas for a fun, farm-imbued weekend road trip. Once you hit the gravel driveway, you’re already in the thick of it. Surrounded by a 400-acre private natural reserve, al fresco thermotherapy awaits. Snap on your bathing suit, slide into those flip-flops and hit all the offerings a day pass affords: Panoramic Finnish saunas, outdoor whirlpools, ice cold plunge pool, waterfalls, Turkish bath, sweat lodge, forests, a solarium, and relaxing lake views amidst steamy thermal air. The Lumami slow food café is an oasis itself – all warm and woodsy with floor-to-ceiling views. I recommend the grain bowl with shiitake cold broth and puffed grains. And, there’s wine! Located at the base of Mount Orford, this is a new ski-in, ski-out resort with chic rooms and lofts in varying sizes, some with kitchenettes, fireplaces, and balconies. 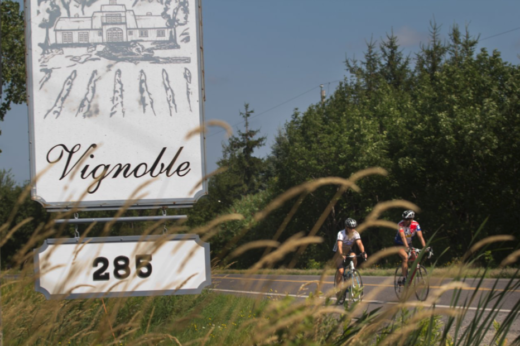 Ski season may be over, but that means that cycling season has begun, and Espace 4 Saisons is a certified “Bienvenue Cyclists” (Hello Cyclists) lodging establishment. This means they can suggest rides for every level, point out the best spots to stop for views, and will suggest delicious restaurants along your route. Once you return you can lock up your bike in individual bike lockers, have a burger and brew on the terrace, or spend dinner on the local Orford Express train. We spotted the Holsteins first. Actually, first we saw the people smiling and snapping photos of the very friendly cows, then we saw the black and white beauties, then we saw Fromagerie la Station on the other side of the road. This is a family-run farmstead cheese company, which means the milk comes from a single herd of cows that, once mid-May rolls around, step outside of their shelter to graze on organic clover and alfalfa. 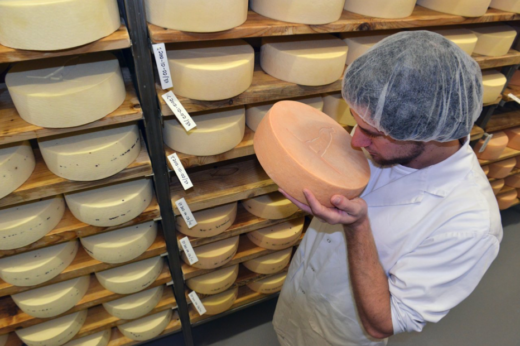 Their raw, organic milk is made into creamy, semi-firm and firm cheeses, including Raclette and their signature Alfred Le Fermier. I was so impressed by what I tasted I bought about two pounds of cheese, and a fondue set for good measure. Imagine springtime in the 1900s – that’s the feeling you get as you swan onto the estate of this Relais & Chateaux property. After you tour around the historic village of North Hatley, the gardens surrounding the hotel will make you sigh, as will the views as you walk around lake abutting the property. Once the summertime destination of wealthy Americans such as Henry Atkinson, owner of Georgia Power in Atlanta; Manoir Hovey is the home he had built for himself – all verandahs, white pillars and charm. Shoulder season means you can stay in one of the 28 exquisite rooms for about $200. What’s a bucolic road trip without a stop at a winery? Here, the sloped vineyards, just starting to turn green, overlook Lake Brome, with views of Mount Orford, Owls Head and Sutton. Stay for a 45-minute tour, sample the reds and whites, then take home a winning bottle of Reserve Baco, Riesling, Ice Wine or a late vintage Vidal. 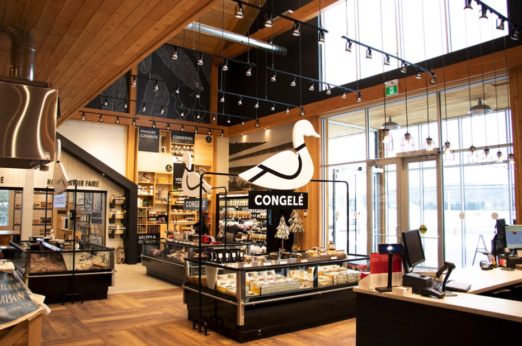 And don’t forget to stop at the new, nearby Lac Brome Ducks shop for more Quebec souvenirs – all manner of locally raised duck – from whole fresh or frozen to confit, duck pot pies to duck stock.